Infra-Tect received NSF certification, February 2014, for the material and manufacturing process involved with the Bevel-Sert. What does this mean for you? You now have the product solution for water and wastewater pipes that will save you time and money, help mitigate corrosion and eliminate an OSHA-prohibited repair practice. How? The Bevel-Sert is an HDPE NSF-61 certified beveled radius ring. 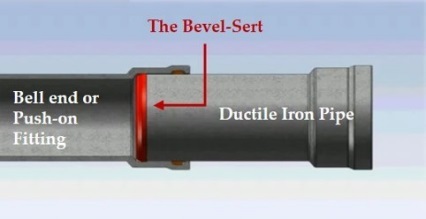 When used with mechanical joint and push-on fittings, it acts as an insulator and a barrier between the two pipes. It help to stop the electrical current passage at the assembled joint which, in effect, mitigates corrosion. Moreover, Bevel-Sert takes less than one minute to install vs. the 7-150 minutes of time, direct costs and equipment involved today. Additionally, it requires less assembly force. Using the Bevel-Sert saves anywhere from 30%-90% in installation costs.